Nigeria’s Department of State Security today issued a press release detailing the reason they invaded several houses owned by former National Security Adviser, Col. Sambo Dasuki (rtd). The statement signed by one Tony Opuiyo stated that Mr. Sambo initailly resisted a legitimate attempt to search his official residence, using soldiers to barricade himself inside. The refusal of Mr. Sambo to allow a thorough created a tense standoff between the SSS team that arrived his home with a search warrant and his military guards, according to the statement. The SSS also detailed how Mr. Sambo kept high-grade rifles at his official residence and how he lined his parking lot with at least 5 luxurious armored cars ostensibly purchased with stolen government funds. Gentlemen of the Press, good evening. 2. On 16th July, 2015, about 1650 hours, based on credible intelligence linking the immediate past NSA, Mohammed Sambo DASUKI (Col Rtd) with alleged plans to commit treasonable felony against the Nigerian State, operatives of the Department of State Services (DSS) conducted a search on the properties belonging to the former NSA, Mohammed Sambo DASUKI (Col Rtd). The properties are on Nos. 13, John Khadya Street, Nos. 46, Nelson Mandela Street, both at Asokoro, Abuja, and Nos. 3 Sabon Birni Road, Gwiwa Area, Sokoto, Sokoto State. 3. The search operations was planned to be simultaneously conducted, but DASUKI, refused the operatives entry into his main residence located at No. 13 John Khadya Street, Asokoro, despite being presented with a genuine and duly signed search warrant. Consequently, what was to last not more than two (2) hours, lasted more than ten (10) hours, up till the early hours of 17th July, 2015. Indeed if not for the sense of maturity and professionalism of the officers and men assigned this task and the very good understanding and timely intervention of the new Chief of Army Staff, Tsukur Y. BURATAI (Maj Gen), there would have been a clash between the Army operatives guarding the house and Service operatives, as SAMBO directed the soldiers on duty not to allow any movement into his house, despite the subsisting court order. SAMBO thereafter raised a false alarm to the military authorities to come to his aid as he failed to correctly tell the military that his property was about to be legitimately searched. 4. Gentlemen, please recall that SAMBO retired from the Army as a Colonel, and therefore not entitled to have military guards, if not for the fact he was NSA. Even as NSA, such guards should have been withdrawn after his removal as NSA since he would not have been entitled. 5. The search was thoroughly conducted, and several items recovered, among which were some incriminating items. These include seven (7) high caliber rifles, (high assault weapons), several magazines and military related gears. 6. The team also recovered twelve (12) new vehicles, out of which five (5) were bullet proofs. 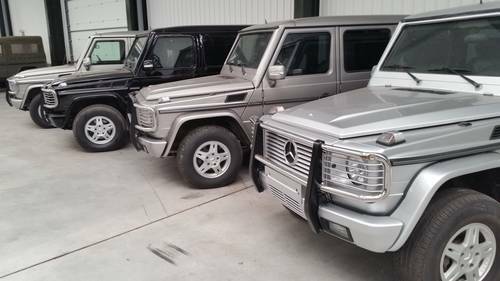 These vehicles which are all exotic vehicles were retrieved from SAMBO’s residence having failed to produce evidence of ownership. For instance, what could he be doing with five (5) bullet proof cars as a retired NSA?. These cars which from all available evidence were purchased with tax payers money, were being kept for possible sinister enterprise. 7. The Service would want to state categorically that this search operation is not a witch hunt. The Service decided to move at this time in line with current management resolve to be proactive and pre-empt individuals with penchant for impunity and lawlessness from putting back the nation to the dark days. The Service is also aware that the lethal arms and the vehicles recovered were not reflected in SAMBO’s handover notes or what could a former NSA be doing with destructive weapons and bullet proof cars which put together could disrupt the peace of any city in Nigeria for a while. 8. On the search of his three (3) properties, including the Sokoto residence, the Service is aware that in his capacity and given his antecedents, he might decide to use any of his residences for such diabolical plans, rather than his main residence. 9. Gentlemen of the press, the Service Management would want to assure members of the public that it would not trample on the freedom of individuals or groups as guaranteed by the Nigerian Constitution and emphasized by the current administration’s position on transparency, and probity underlined by justice and equity for all Nigerians. This is the driving force for all DSS operations. However, the Service would not hesitate to go after any person or group of persons, no matter how highly placed once such individual (s) breach or attempt to breach the laws of the Federation. The days for impunity and indecisiveness in the face of unpatriotic acts by individuals operating against the State are over. The Service hereby appeal to all Nigerians to be law abiding and partner with it in ensuring a peaceful and secured nation. In the same vein, those that are bent on breaking the rules governing our peaceful co-existence due to either the huge ill gotten wealth they have acquired or imaginary hold they think they have on our nation’s survival, are being warned to rethink. The DSS will use all constitutional means as defined by its mandate to deal decisively with such unpatriotic individuals. 10. The Management want to seize this opportunity to appreciate Nigerians for the tremendous acts of goodwill that is being extended to the new dispensation. The Management also wish to assure Nigerians that the gesture and confidence being expressed will be reciprocated with more dedication and service to our dear country Nigeria. 11. Happy Eid-el-Fitri to you and indeed, all Nigerians.